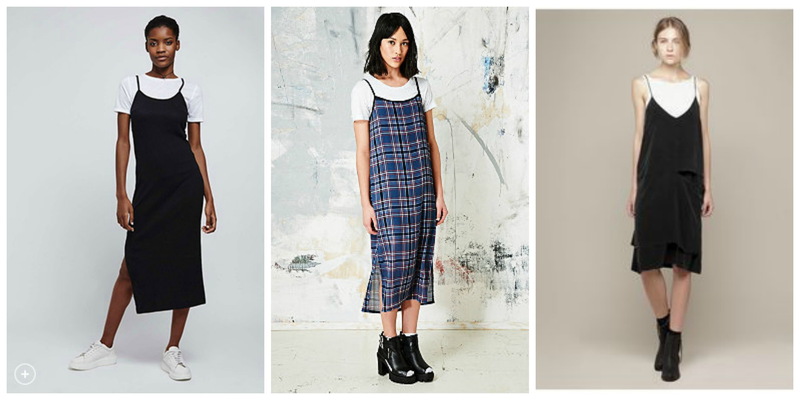 Wide-leg pants are back in fashion, so why don’t you give them a try! In today’s blog post I want to show you 25 awesome wide-leg trousers you can wear with different tops and shoes. These bottoms were popular in the 1920’s and seventies. I love to see old images of street style stars, who appeared in high-waisted arrow trousers. Nowadays, wide pants are much more popular than skinnies, as they allow to feel comfortable and free as much as possible. Of course, you should consider the fact how to wear them right and how to make them look awesome with other clothes. Below are shown my favorite ideas on how to do things right. Get inspired and tell me your thoughts about these trousers. These neon yellow trousers appear to be trendy and very special paired with a printed jacket and classic black leather stiletto pumps. Add aviator sunglasses and neon yellow shoulder bag. What type of shoes do you tend to wear when you want to take a casual walk on the town? I guess it’s something flat, simple and versatile. Yes, today’s topic is all about flat footwear and our favorite casual outfit ideas you can create with this footwear. The following ideas are meant for an inspirational view and I recommend to take a close-up look at these simple combinations to find something interesting and worth copying. Flat ankle-strap pumps in leopard print look eye-catching and glamor! 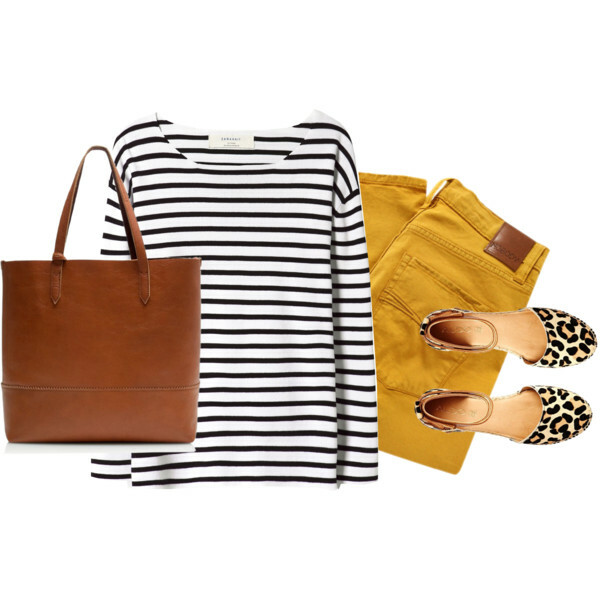 Try them on with mustard jeans, black-white striped long sleeve top, and brown leather tote bag. The following article is about different ways you can wear loafers. It’s always fun to wear menswear-inspired clothing and footwear. I tell you honestly, this is my favorite type of footwear and I do like to wear it in different ways. So, how to wear it and with what? Loafers became popular in 1960’s thanks to Gucci fashion house. There are known several types of loafers, including tassel loafers, penny loafers, and embellished designs. 1. A shiny silver pair of loafers is ideal for underlining your individuality. You can try this footwear with a smart-casual suit, or keep things relaxed and ladylike by adding a sleeveless blush dress with Peter Pan collar and pleated skirt. If this combination looks too much girlish to you, then you are free to add a denim shirt to cover your shoulders. This article describes simple and easy ways to wear midi skirts and ankle boots. This footwear looks great with almost every clothing bottoms. Ankle boots might be one of my favorite shoes, as I can easily pair them with jeans, shorts, and skirts. Today’s fashion world offers plenty of interesting ankle boot designs, starting from classic chunky heeled versions, lace-up classics, to pointed-toe Chelsea designs, cut-out must-tries, and embroidered options. Every shoe construction is unique by itself, that’s why I think it’s important to find out best ways how to make skirt and boots combination look harmonious and street-wear appropriate. 1. High-low bottom piece in cream-gray color can draw attention to your chosen camel ankle boots. Complete this casual outfit with white sleeveless top and dark blue leather jacket. If you start questioning yourself what are the best shirts and tops to pair with boyfriend jeans, then I do think you should have a look at the following outfit ideas you can copy this year. Your boyfriend jeans can be mixed and matched with various tops. You can still wear classic button-down shirts, sweaters, slouchy blouses, ruffle spaghetti strap tops, as well as many other functional and fun-looking designs. 1. For the ultimate seventies inspired look, mix pinstripe shirt with washed blue boyfriend jeans and peep-toe bright blue ankle boots. Add a printed fur collar jacket and navy-blue shoulder bag. Love the way how the lower part of these jeans are frayed and ripped. Today’s article is dedicated to pastel color blazers and ways to wear them this year. Everyone loves pastel colors and it’s no wonder why, they are sweet, gentle and ladylike, but you should pay attention combining them with your clothes. One misstep and you can end up looking like a little child. I do recommend to take a look at these outfit ideas and see the best ways how to wear pastel blazers. Once you buy a stylish pastel color blazer, you can wear it with light neutral colors, or pastel shades. Keep in mind, bright colors can disharmonize your blazer. The following collection includes different ways how to make pastel blazer look great with your everyday clothes. 1. Turquoise blazer matches this high-neck white sleeveless blouse tucked in printed pastel shorts. Add pastel violet strappy heeled sandals and cream blush handbag.